An insect called the fall armyworm has already eaten crops in the Americas and Africa. Now it is doing the same in Asia. The young worms are about the size of a person’s smallest finger. They can damage maize especially, making the vegetable soft and wet. In 2016, fall armyworms ate up to half of some African farmers’ maize, sorghum and millet. Then the insects spread through Yemen, China and Thailand. Uraporn Nounart is an expert on farm pests at Thailand’s Agriculture Department. “We never had this one before,” she says. 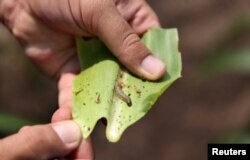 The fall armyworms were found late last year and early this year in an area northwest of Bangkok. “It’s a big problem,” Nounart added. The worms can make farmers lose their profits, and they are difficult to fight. Yet limiting the insects is critical. Although Asia is known for its rice growing, maize is also a major crop and an important source of food for chickens, cows and other animals. FILE - A crop-eating armyworm is seen on a sorghum plant at a farm in Settlers, northern province of Limpopo, Feb. 8,2017. The fall armyworm is native to an area that spreads from Argentina to northern Canada. There, the insect has natural enemies, like bacteria and predators. They help keep the fall armyworm population at acceptable levels. But, such help is not found everywhere. The United Nations’ Food and Agricultural Organization is holding a meeting in Bangkok this week to share information about how to battle the insects. Experts note that chemicals against the worms are costly, dangerous and do not always work. So some farmers in Thailand are trying other ways to fight the fall armyworms. In Kanchanaburi province, farmers search for the worms in their fields. They find the insects in all stages of crop growth: from plants that are just starting, to those that are knee-high, to plants that are almost as tall as an elephant. When they find the worms, the farmers pull the tops off the corn and throw them away. They hope the plant will grow another piece of corn that can be harvested later. But, some fields still lost about one-third of the first harvest. In another field, a younger farmer used unpiloted airplanes called drones to treat his fields. Another researcher in Thailand is collecting the fall armyworms’ eggs. He is hoping to find natural enemies of the worms, such as wasps. She notes that the worms turn into moths. They can fly more than 100 kilometers at night, or more if they are carried by the wind. The best plan, says Fredrix, is for farmers to find the worms as soon as possible so they can keep them under control. As it happens, there is an app for that. The FAO has developed an online tool that teaches the basics of how to find and deal with fall armyworms. Fredrix says this new pest needs to be controlled for years to come. Elaine Kurtenbach reported on this story for AP. Kelly Jean Kelly adapted it for Learning English. George Grow was the editor.